40 years after that horrific Halloween Night in 1978, two British podcasters want to interview Michael Myers, who’s been locked up for decades and hasn’t spoken a word. When they fail to get anything out of him, they turn to Laurie Strode (Jamie Lee Curtis), who’s living as a recluse near Haddonfield, Illinois. She’s never gotten over the trauma of that night, which has damaged her relationship with her daughter Karen (Judy Greer) and granddaughter Allyson (Andi Mitchak). She’s spent most of the past 40 years arming and training herself to kill Michael Myers, an unhealthy obsession most people in her life consider a waste of time. But when a patient transport bus crashes and Michael escapes, Laurie is forced to relive the nightmare that has haunted her for decades and face the faceless shape that has consumed her sanity. Glossing over the fact that the last Halloween movie to come out was Halloween II (2009, Rob Zombie), there’s something alluring about doing a sequel to the original after 40 years. And it works surprisingly well for Halloween. 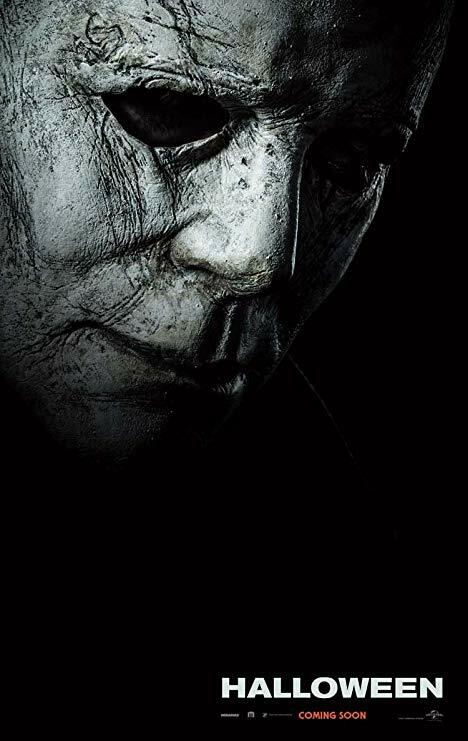 Michael Myers was 6 years old on his first night of killing and waited 15 years for his second, so waiting 40 years for his third is not as big a stretch as it sounds. What made Michael Myers frightening in the first movie was how selective he was with his potential victims. He could wait in the shadows while dozens of oblivious people walked by, and then the very next person would become his victim. It wasn’t something they did or who they were. He. Would. Just. Pick. THEM. He never got annoyed or stressed, nor was he ever angry when he killed. He was pure evil, and that’s the Michael Myers we get here. The one Dr. Loomis described all those years ago. One thing that always bothered me about the other sequels was that they would show Michael Myers’ eyes. The original never did, and neither does this one. It keeps his “face” blank, pale, and emotionless, as it should be. You obviously know he’s a monster, yet somehow he’s unpredictable too. And once he puts on his mask and the sun goes down, he moves around like he owns Halloween Night. That’s what makes him “The Boogeyman”. Like most well-thought-out horror movies, this one begins slowly. It takes its time to establish the characters, their relationships, and the environment they live in. Allyson’s social life is surprisingly entertaining, and her friends turn out to be far more likable than expected (but since this is a horror movie, you know what will probably happen to them). The British podcasters, Aaron (Jefferson Hall) and Dana (Rhian Rees), act as decent, if not by-the-numbers catalysts for the events that follow. Karen’s (Laurie’s daughter’s) backstory unfolds rather lazily but reaches its pinnacle when the time calls for it. Sheriff Hawkins (Will Patton) is another formulaic character who plays his part predictably. But if there’s one character I could have done without, it’s Michael Myers’ current psychiatrist Dr. Sartain (Haluk Bilginer), who feels like he would be an edgy take on Dr. Loomis had this been another remake. But this movie isn’t about them. It’s about “The Boogeyman”. And when Michael Myers isn’t stealing the movie, Laurie Strode positively is. Halloween is hardly her favorite time of year and she doesn’t even try to be what society considers “normal”. She stalks her grandchild, and even breaks into her daughter’s house to prove a point. Jamie Lee Curtis delivers arguably her toughest performance in this entry. Laurie is driven by years of despair combined with the practicality of wisdom. Michael Myers may have the “face”, but Laurie Strode is the heart. Nothing can ever match the unrelenting atmosphere of the 1978 original. As much love as there is to the original here, it’s just not up to par. It’s well-crafted, but there are still pacing issues. There are decent characters, but they meander more often than not. They recreate classic shots, but they lack the impact they had in the original. There are a number of intense scenes, but also a few too many “safe” scenes. This is still a reasonably competent horror film and one that tries much harder than previous sequels, but the atmosphere just isn’t quite there. Nevertheless, the final 20 minutes of the movie are where it’s at. The tension is so strong you could hear a pin drop. It’s the type of final scene most horror movies can only dream of. It almost makes everything that happened before it worth it. (Almost.) And while the ending could have been better, it still works for this kind of horror movie, leaving it open for another sequel, or if you prefer, not. All flaws aside, this is the best Halloween sequel they’ve ever made. Take it or leave it.